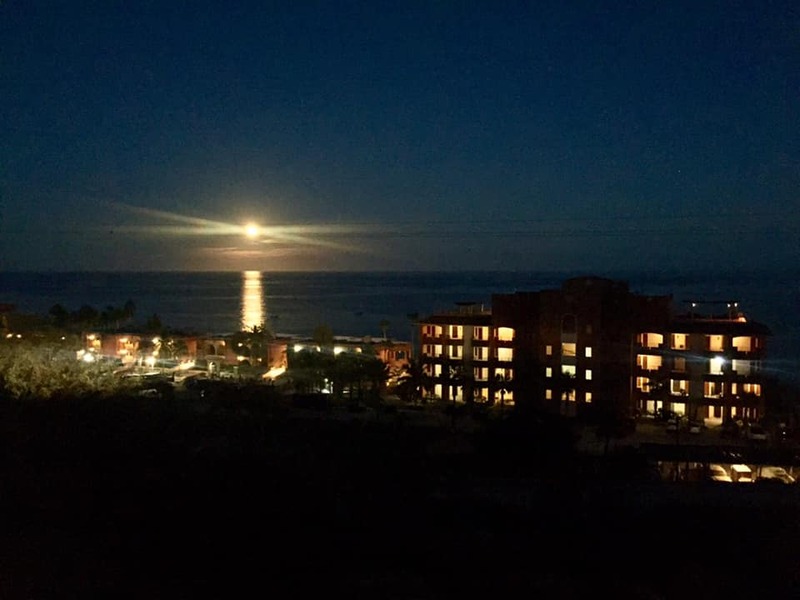 Discussion in 'Baja Bytes By Gary Graham' started by Baja Bytes, Dec 25, 2018. I just returned from a seven-day long-range fishing adventure to Guadalupe Island onboard the Shogun. In addition to great tuna fishing, the trip also included a stop at the remote lobster fishing village on the island, where some 53 of the residents are children. The usual deep-water spots in the flats between the shore and South Island are still the “go to” spots for rock fishing (which is still the main game) but keep a surface rig with a small chrome jig or spoon ready to go in case a bonito cruises through while you are bottom fishing. Bass fishing has also been decent on the hard bottom spots outside kelp beds, with sand bass and a few calicos eating plastics and fin bait down on the bottom. Rock fishing is still fair around the islands, and there are also some bonito and an occasional small yellowtail back in the picture at some of the usual spots around the islands proper, like the Keyhole, Middle Grounds and from the Lighthouse to South Kelp Ridge. Hmmm…old photos usually mean one of two things … no clients or slow fishing. Same fishing results as we have been having for the past three or four weeks with one positive exception! Captain Idelacio with a rookie family that did some serious damage to both fish and under-used arm muscles. Our top captain put some rookies on to the usual targets up toward the San Bruno area and ran into a school of yellowtail. They managed to put 9 medium-sized tails on ice along with the usual cabrilla and a few dorado. If you are like many, you dream of the perfect trip with family or friends to fish, dive, explore and learn. We all crave a little adventure in life and the crew at Baja Adventure Co. is here to make it all happen. 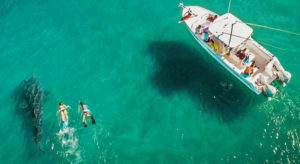 Baja Adventure Co. or BACo is in the business of making your fun go flawlessly and they are tailored to suit your needs and expectations. All around fishing action was slower on the grounds from the Gordo Banks to Vinorama. Bait supplies consisted of caballito, slabs of squid and some ballyhoo; still no sign of sardina showing up along local beach stretches. Wind has been more relentless this season, as green water and cooling currents have turned conditions over. Very few yellowfin tuna were striking this week. 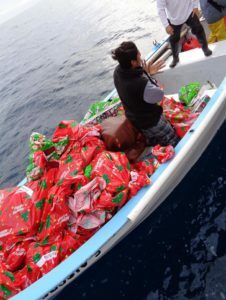 Most of the tuna found on Friday were averaging between 15- to 20-pounds and were caught while drift-fishing with strips of squid Iman and Vinorama. 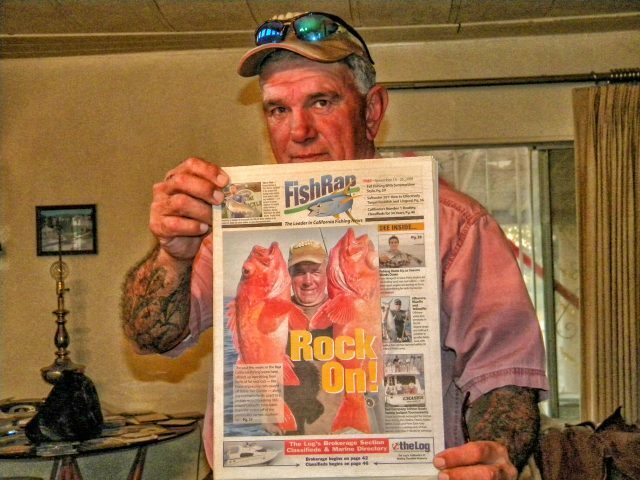 There was an 80-pound yellowfin landed off the Gordo Banks, along with one nice 30-pound yellowtail brought in, and a few deeper-water grouper in the 25- to 30-pound class. Of course, triggerfish continue to dominate all bottom fishing closer to shore, with a few snapper, amberjack and pargo in the mix. Billfish action has been very good through the first part of the week on the Pacific side of Cabo San Lucas; off San Jose del Cabo there has been only a scattering of striped marlin seen. One late-season black marlin was hooked off the Gordo Banks, but this fish eventually broke off. Dorado and wahoo activity were almost nonexistent with just an occasional fish being found. Early in the week several wahoo were hooked north near Vinorama, and on Friday a 45-pound wahoo was brought to the table. 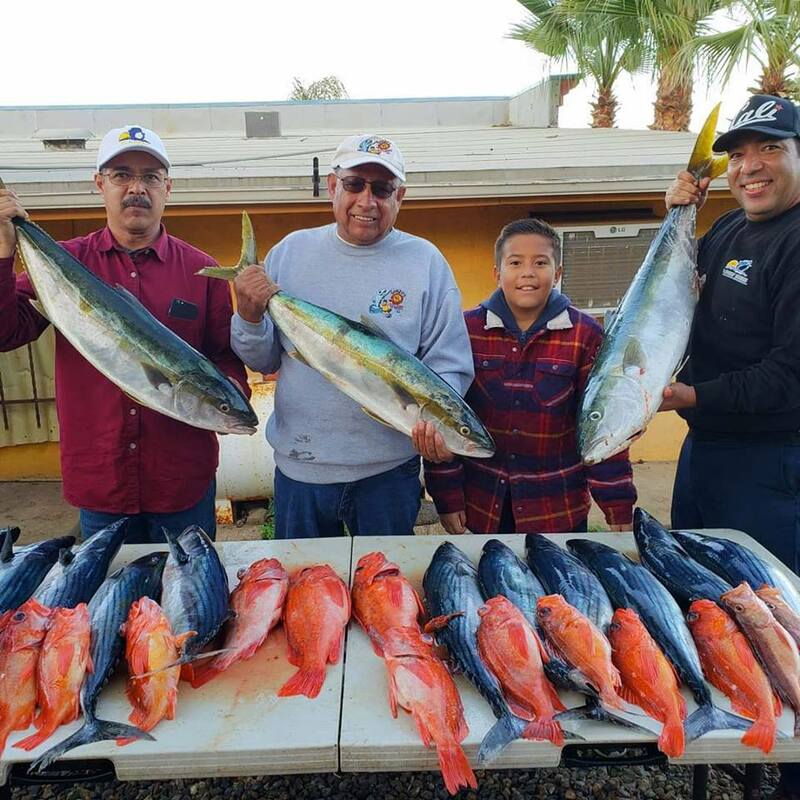 We are hoping for nicer, calmer weather conditions, which would give the water a chance to clear up some, allowing wahoo and dorado action to rebound before the water becomes too cold which would these gamefish migrating to warmer southern waters. Along the shore, especially off the San Jose del Cabo Hotel zone, there was good action for roosterfish ranging in sizes up to 20-pounds. 229lbs tuna just hit the dock — Not included in the week’s report, but it was caught on Pisces 42’ HOT ROD, by ANGLER ARLENE DYCK from KELOWNA, BC. Numbers at a glance: Billfish 67%, tuna 52%, dorado 7%, other species 5%. Not included in the week’s report: a 229-pound tuna just hit the dock! It was caught on Pisces 42-foot HOT ROD, by ANGLER ARLENE DYCK from KELOWNA, BC. More striped marlin and yellowfin tuna this week along with the seemingly never-ending Finger Bank action! 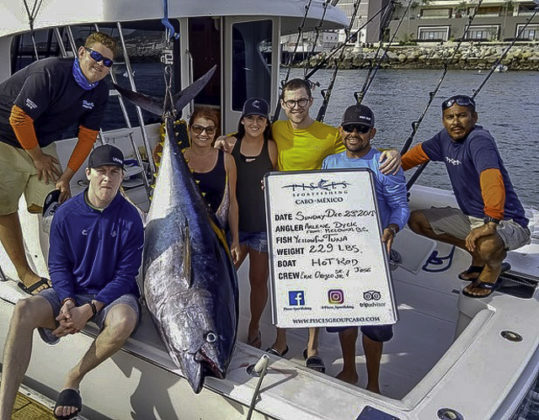 Plus, an estimated 500-pound blue marlin was released aboard the Pisces 31-foot Rebecca, along with some fun, small game which included grouper, sierra, pompano and triggerfish. Dorado numbers have gone down quite a bit, but still around for those looking; it’s hard to find them. Anglers Brian, Katie, Melissa, and Nancy Kura aboard the Pisces 31-foot Rebecca were so excited on their first blue marlin release that they didn’t even take a picture! They reveled in the moment, with Ms. Kura doing a great job of fighting the fish for about an hour and a half before it was brought to the boat and safely released. Captain Jose Ramon Alucano and Mate Luis Cota put the fish at approximately 500 pounds. 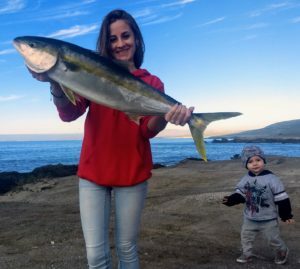 The marlin hit on a flying fish lure (white/blue) out of San Jaime, where they had also released a small 60-pound striped marlin on mackerel. And as if this wasn’t enough, they also landed 5 nice tuna for dinner, all between 10- and 20-pounds, which hit on cedar plugs and feather lures. We had several boats head up to the Finger Bank this week, also with raving reviews. Double-digits of striped marlin on the line, with our top release boat in one day, the Pisces 31-foot Tracy Ann releasing 29 striped marlin by Cabo locals and anglers from Laguna Beach, Calif.
Again, Pisces 31-foot Ruthless impressed with a total of 66 striped marlin released at the Finger Bank this week. With Canadian anglers Kyle Mixon and Tamara Elwaypps from Ontario, having a spectacular day by releasing 24 striped marlin up to 180-pounds, as well as scoring a bait ball swim with the “stripeys.” Tamara said to dock-masters that “it was just an absolutely spectacular experience with 4 marlin on the line every moment.” Wildlife included bait balls, marlin everywhere, sea lions, dolphin, turtles… Don Switzer and Ed Wyatt has a similarly spectacular day on the Ruthless later in the week, catching 19 and releasing 18 striped marlin from 90- to 150-pounds using mackerel bait as well. December 16th, Ruthless caught and released 15 striped marlin at the Finger on live mackerel bait for anglers Eugene and Michael Haines who also caught 10 yellowfin tuna of about 10- to 20-pounds each on cedar plug lures. December 20th was a great day at the Finger Bank for our fleet, with most of our 31’s heading up there and releasing double-digit numbers of marlin. 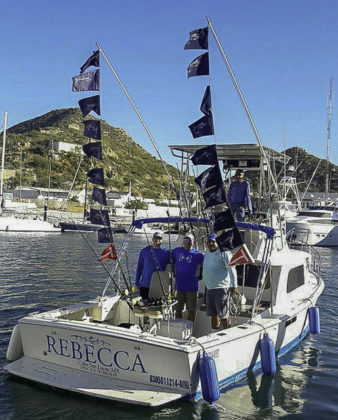 Pisces 31-footRebecca released 16 stripeys as well as landing 4 tuna (just before arriving at the Finger itself); Tracy Ann released 15 stripes and 32-foot Bill Collector released 18 stripeys with the largest approximately 200-pounds. All marlin were caught on live mackerel. But the marlin action wasn’t only at the Finger, as Pisces 31-foot Tiburon stayed closer to home and caught and released 4 striped marlin at Golden Gate with anglers Douglas Schafer, Michael Popov and Toki Schafer on board. Live mackerel bait was used along with guacamayo lures, and marlin were between 100- and 120-pounds each. 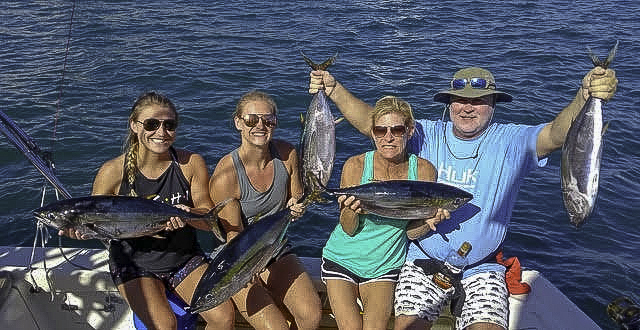 Anglers the Yates family and friends from Dayton, Texas, also fished with the Tiburon earlier in the week and did well catching and releasing 3 striped marlin between 80 and 100-pounds each on mackerel bait and guacamayo lure close to the San Jamie area. They also caught 2 dorado on mackerel and cedar plug lures, weighing about 10- and 12-pounds. December 21st Rebecca headed to the Finger again, this time with anglers Nicholas and Dan Raff, catching and releasing 18 striped marlin between 90- and 120-pounds each. Pisces 38-foot C Rod had some great fishing with 9 striped marlin caught and 8 released at the Finger this week; all marlin weighing approximately between 80- and 150-pounds each. They used live mackerel and managed to land 3 yellowfin tuna as well, weighing about 15-pounds each on cedar plugs and feathers just before the Finger Bank. Anglers were Nancy Lundin and Scott Reddam from Ontario, Canada. The previous day, Pisces 38-foot C Rod also fished for marlin closer to home, releasing 4 striped marlin on mackerel bait at the Old Lighthouse. Anglers were the Sime family from Alberta, Canada, including young Hailey, 9 years old, and Rachel, 6 years. Pisces 31-foot Tracy Ann released two small striped marlin between 70 and 110-pounds, which hit on a green/yellow lure and on mackerel bait just before Punta Lobos, with Captain Bruce Montano at the helm. They also landed 5 dorado, weighing approximately 10-pounds around the Cerritos area on cedar plugs. Pisces 35-foot Valerie managed to release a small striped marlin, of about 40-pounds a bit closer to home while fishing the La Ballena area. The small stripey hit on a Hoochi lure and anglers George Green, Michael Freedman and Robert Gorlin also landed 20 football-sized yellowfin tuna on cedar plugs there. Pisces 32-foot Bill Collector released 3 striped marlin on mackerel and guacamayo lures at the 260 Spot for anglers Ken and Lisa Sacks who also landed a nice 20-pound yellowfin on cedar plus lure. 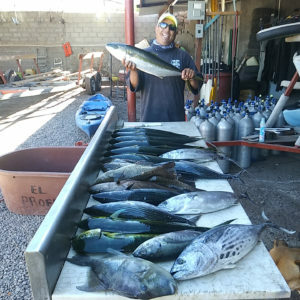 After some nice tuna fishing and a couple of stripeys caught on Bill Collector in the previous week, Judd Toepperweinac and Karla Miller, from Delaware, decided to specifically target some small game fish. They had a fun day catching sierra, grouper, pompano and triggerfish, with 2 sierra of about 4 pounds each hitting on the shoreline close to the Golden Gate area and 2 small grouper and 1 pompano, plus 3 triggerfish total. LOCATION: Finger Bank, San Jaime, Golden Gate, Cerritos, Old Lighthouse. WEATHER CONDITIONS: Nice conditions with sunny and slightly cloudy days, calm seas, and only slight wind in the afternoon on some days. AVERAGE WATER TEMP: High of 79°F earlier in the week, low of 71- to 73°F. BEST LURES: Live caballito and mackerel bait, varied lures: guacamayo, cedar plugs, feathers, Hoochies. 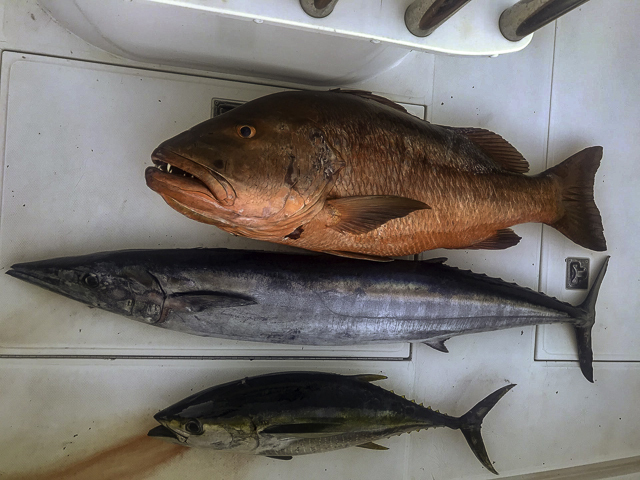 Snappers, wahoo, yellowfin on a 12-hour trip! Another exciting season is upon us and it has started off with a bang! 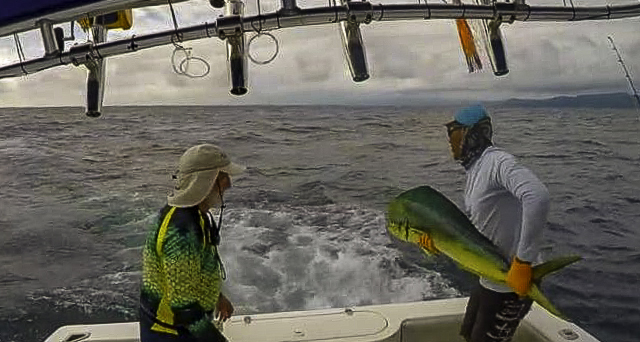 October began with a great dorado run and the boats were releasing up to thirty dorado a day! Santa’s been so busy this holiday season that he was looking for a quick, warm getaway, and Ernesto, the CVL Elf on the Shelf, told him about Casa Vieja Lodge Guatemala! 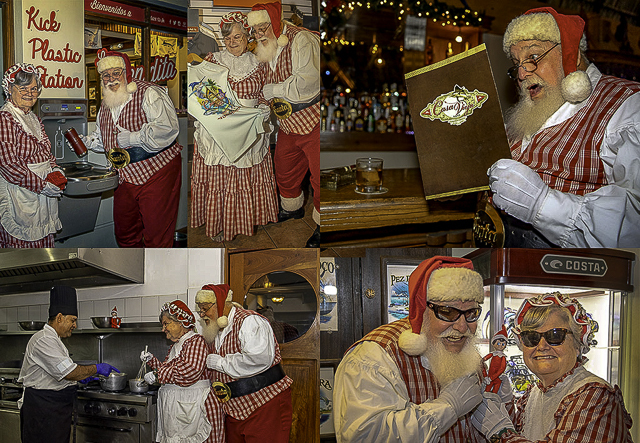 Mr. and Mrs. Claus took a few days to relax, fish, and warm up in anticipation of Christmas Eve. They were impressed with the 5-Star Angling Experience!!! • November 30th-December 3rd – the Makaira (37-foot Rybovich) with Capt. Jason Brice, had 81 raises, 79 bites, and 54 sailfish releases plus 3 marlin raises, 3 marlin bites, 1 marlin release, and 10 mahi-mahi. 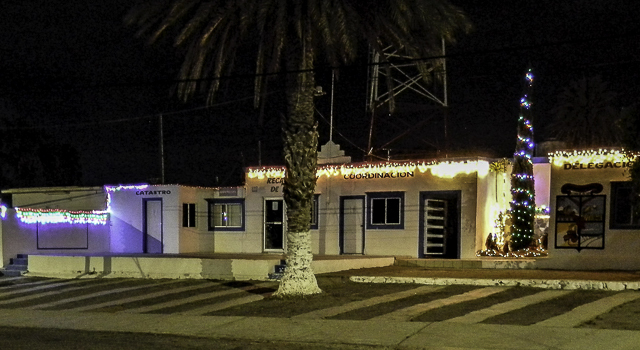 • December 1st, 2nd, 8th & 9th, the El Cadejo (35-foot Contender) with Capt. Benji Bairez, fly fishing, had 48 raises, 14 bites, and 4 sailfish releases plus 3 marlin raises, 1 marlin bite, and 1 marlin release. • December 1st-3rd, the Pez Raton (35-foot Contender) with Capt. Franz Hoffman, had 72 raises, 66 bites, and 34 sailfish releases and mahi-mahi! • December 1st-8th, the Spindrift (38-foot Stolper) with Capt. 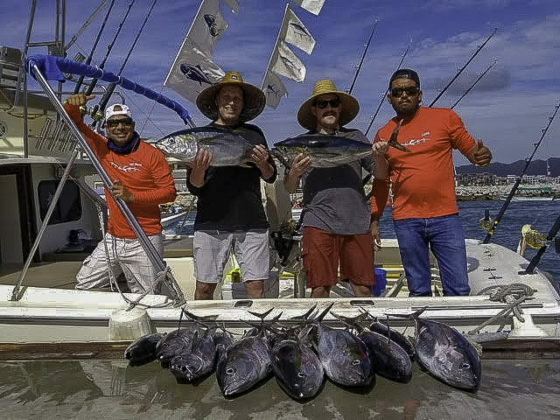 Efrain Rizzo, had 86 raises, 71 bites, and 49 sailfish releases plus 6 marlin raises, 4 marlin bites, 3 marlin releases, 5 tuna, and 12 mahi-mahi. • December 1st-9th, the Afinity (39-foot Billy Knowles) with Capt. Nico Melendrez, had 79 raises, 66 bites, and 54 sailfish releases plus 14 tuna and 10 mahi-mahi! 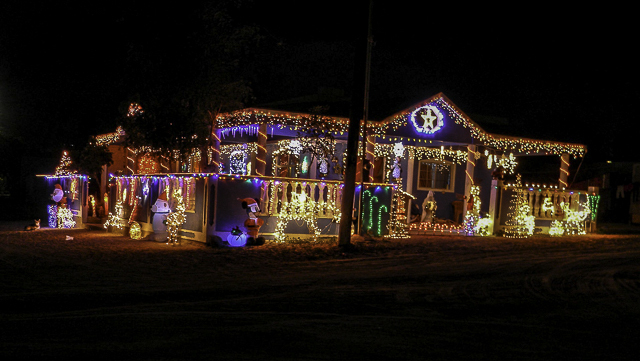 • December 1st-11th, the Finest Kind (40-foot Whiticar) with Capt. Nicho Alvarenga, had 106 raises, 75 bites, and 52 sailfish releases plus 8 marlin raises, 6 marlin bites, 3 marlin releases (1 striped marlin), 23 tuna, and 10 mahi-mahi. • December 1st-12th, the Release (37-foot Merritt) with Capt. Chico Alvarenga, had 139 raises, 120 bites, and 80 sailfish releases plus 11 marlin raises, 6 marlin bites, 4 marlin releases, 38 tuna, and 17 mahi-mahi! • December 1st-12th, the Rum Line (40-foot Gamefisherman) with Capt. Chris Sheeder, had 123 raises, 97 bites, and 63 sailfish releases plus 7 marlin raises, 7 marlin bites, 1 marlin release, 7 tuna, and 9 mahi-mahi. 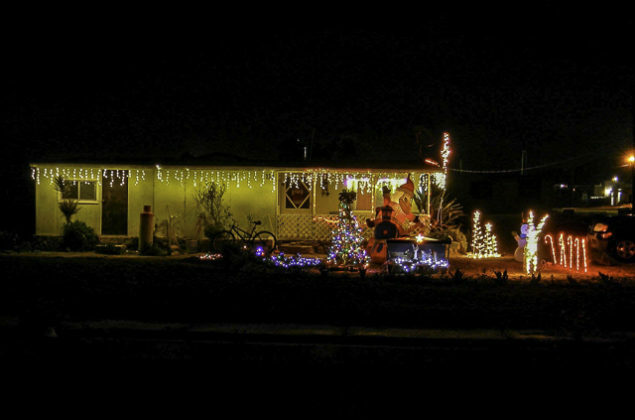 • December 3rd, 6th & 7th, the Poco Loco (44-foot Kincheloe Nickerson) with Capt. David Salazar/Capt. Terry Brennan, had 57 raises, 51 bites, and 39 sailfish releases plus 1 marlin raise, 1 marlin bite, 1 marlin release, 3 tuna, and 3 mahi-mahi. Tunahead, kbray001 and mrkrabs like this. WOW what a report. Delivering those gifts to Guadalupe kids=PRICELESS!!! What a great effort for all who donated and went on the trip. Good job SAC!